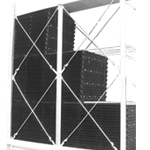 Cross Flow Configuration design provides easier and safer installation and minimize the maintenance cost. 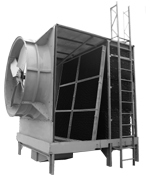 Horizontal Discharge arrangement requires lower headroom and is suitable for indoor installation. The thermal performance is certified by CTI in accordance with STD-201. Drift loss rate is less than 0.001% of circulating water flow rate according to AS 4180 standard. 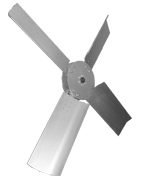 Aerofoil shaped hollow blades are made from Aluminum extrusion alloy and pitch angles are adjustable allowing optimization of the tower performance. 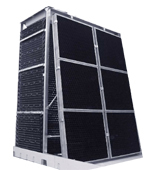 High efficient and light in weight ensure low power consumption. Motors are TEFC type with IP55 protection, Class F insulation and 1.15 service factor. Fans are driven by Vee belts with low tip speed, thus minimizing vibration and ensuring low noise. Fillers are vacuum formed of 0.4mm thick PVC film. Filler sheet configuration incorporate sloped flutes in both air intake and outlet sections and high efficient wet deck media section. The wet deck media section with continuous triangular pattern design provides high efficient heat transfer. Open gravity flow water distribution basin with removable covers is designed for non-clogging operation and prevents the growth of algae. Special design diffusion decks provide 100% guarantee for full coverage of filler by small droplets. 3 passes drift eliminator made of 0.4mm thick PVC sheet and placed in front of the outlet section of filler provides further reduction of drift loss rate to 0.001% of circulating water flow.